This week, the US Center for Disease Control(CDC) said the nation is at epidemic levels of flu deaths. 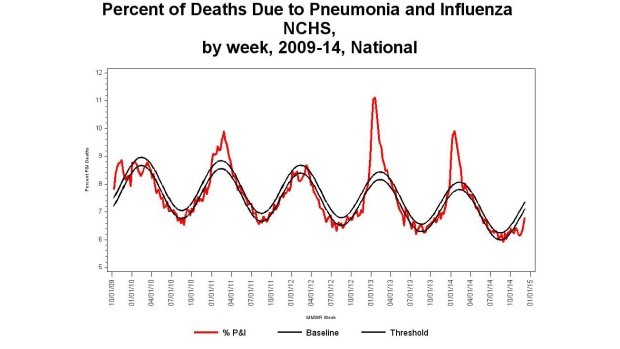 For the 122 cities the CDC monitors, 6.8% of all deaths were related to influenza and pneumonia, bumping right up against the epidemic threshold for this time of year. However, that 6.8 percent is a national number, and regional statistics show that California (and the western states in general) are in far better shape than the rest of the country. 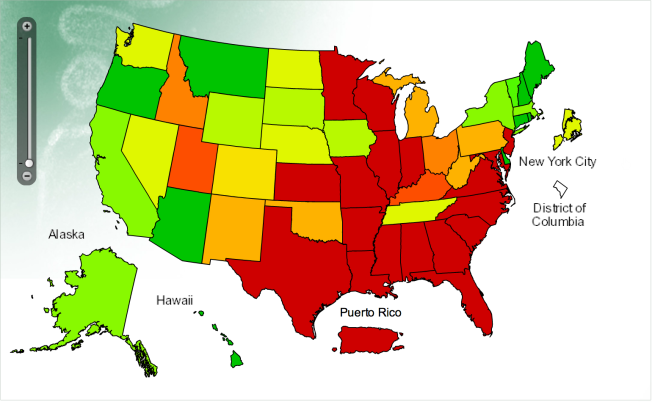 The gif below shows outpatient visits for influenza-like illnesses in each states. It's easy to see the disease has mostly spread in the Eastern, Southeastern and Midwestern states. CDC Spokesperson Darlene Foote told NBC News: "The United States experiences epidemics of seasonal flu each year and right now, all of CDC’s influenza surveillance systems are showing elevated activity." California is doing better than most at the moment, but the latest rise in deaths is probably the beginning of an upward trend. As the CDC pointed out, there's a flu epidemic every year, and in 2013, deaths peaked at the beginning of the new year. You may have already heard about the "genetic drift" that has caused some current flu strains to mutate ad become resistant to this year's vaccine. Right now, the CDC is still recommending that people get their flu vaccines as soon as possible. Pharmacologist and Forbes.com writer David Kroll argues that the worry about "drifted viruses" is overblown. He points to the relatively small sample of viruses that have been tested and categorized (currently 305 out of about 28,000 available samples). "For statisticians," Kroll wrote on Wednesday, "the question is how representative that 305 is of the larger group. But even in that 305, more than four out of ten are a good match for this year’s vaccines." Flu vaccines are widely available and often free. But as the NBC Bay Area Investigative Unit reported, California has wasted millions of dollars to inefficiencies in the system. The California Department of Public Health distributes flu vaccines to county and city authorities each year, who handle distribution themselves. The Investigative Unit found that some counties don't use thousands of vaccines allotted to them and end up sending them back to the state at the end of the year. One county, Calaveras, sent back 38 percent of their allottment over several years. The map below shows that many smaller counties have a hard time distributing their allottment compared to counties like San Francisco or Alameda. But there some very populous places, such as Orange County in Southern California, which has failed to use more than 23 percent of the vaccines they recieved between 2008 and 2012.